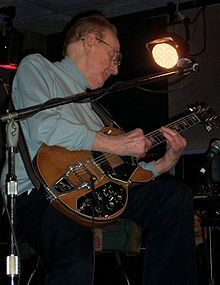 Les Paul (born Lester William Polsfuss, June 9, 1915 – August 13, 2009) was an American musician and innovator. He is famous for his work in electric guitars and in overdubbing. He was born in Waukesha, Wisconsin. The solidbody electric guitar Les Paul which is named after him is made by the American company Gibson. It is one of the most famous guitar models in rock music history. Paul died of complications from pneumonia at White Plains Hospital in White Plains, New York. ↑ Newels, Eric (August 17, 2009). "Music Great Les Paul Dies at 94". idiomag. Retrieved August 21, 2009. This page was last changed on 5 July 2016, at 20:36.